Playa La Jolla is the real beach lifestyle. Just outside of Rocky Point, this beautiful stretch of beach avoids the crowds found at the larger resorts. Condo Luna 2 can be rented for up to 6 visitors. The complete home can be rented if you have a larger group. 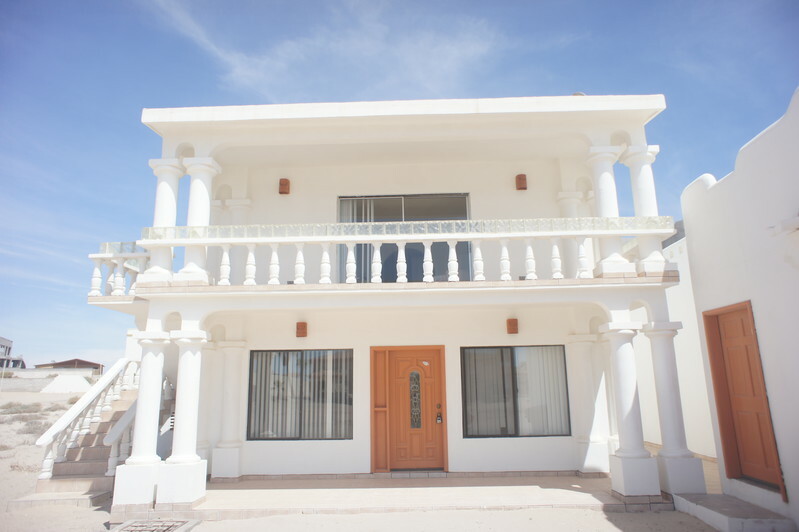 Casa Luna 2 has 2 bedrooms, and 1 bathroom. The living room of the condo is furnished with a gold, green and burgundy striped sofa that folds out to a bed, a matching love seat and wood framed art prints mounted on the walls. The living room also includes a lighted wood end table, slatted coffee table and a media stand. The room has two windows that allow natural light to illuminate the room in the daytime hours. The dining area between the living room and kitchen is furnished with an oval shaped table that has a yellow floral printed table cloth and seating for 6 guests. The kitchen has raised panel oak wood cabinets with dark green laminate counter tops and white and black appliances. There is a window above the sink where you can listen to the sounds of the tide and a ceiling fan above to keep the kitchen cool while cooking. The kitchen comes with all the major appliances and also a coffee maker, blender, and toaster. You will find the drawers filled with utensils and silverware and the cabinets filled with glasses, pans, pots, bowls and dishes. The kitchen has most all the items needed to prepare delicious home cooked meals. The 1st bedroom has a queen size bed with a red comforter and two green pillows. The room includes a lighted bed side table, wall mounted art prints and a window with a view. The room also has a large double door closet to hang your clothing. The 2nd bedroom has a queen size bed with a tan bedding set and 2 green colored pillows. The room has a lighted beech wood bed side table, one framed art print and a window with a view. The room also has a double sliding door closet to store your clothing. The bathroom between the two bedrooms has a walk in shower with a sliding glass door enclosure, a single mirrored sink vanity and a commode. The home would be great for a small family or for 2 couples seeking rest and relaxation. The condo is just a short walk down from the beach where you can build a sand castle, get buried in the sand or collect sea shells. Take a dip in the ocean or explore the wonderful sea life inside the tide pools. You can lay your towel down in the sand and soak up the sun’s rays. This home is a bit out of town so be sure you have all the items you need. Check now for rates and availability. Restrictions - no ATV's or fireworks allowed. No pets in Condo 2. Also, there is no TV.